Website@School is a website content management system (CMS) specially designed to both learn and build websites for schools. It has special features for blind and visually impaired users and web masters. Website@School has a firm foundation, both on the visible surface as well as 'under the hood'. Its piles were forged with the help of Jürgen Habermas and Donald Knuth. Jürgen Habermas (1929- ), and his 'Theory of Communicative Action'. Donald Knuth (1938- ), American computer scientist and his 'The Art of Computer Programming'. Célestin Freinet (1896-1966), and Paolo Freire (1921-1997). A French pedagogue and educational reformer and a Brazilian educator and influential theorist on education are our indispensable guides when thinking about a website learning tool for education. Almost a hundred years ago Freinet already saw the possibilities of modern technologies in the hands of students for real life learning and communication, while Freires thoughts on reciprocity fit in the Open Source philosophy. - Pedagogy of work (pédagogie du travail): students are encouraged to learn by making products or providing services. - Enquiry-based learning (tâtonnement expérimental): group-based trial and error work. - Cooperative learning (travail coopératif): students co-operate in the production process. - Centers of interest (complexes d'intérèt): the children's interests and natural curiosity are starting points for a learning process. - The natural method (méthode naturelle): authentic learning by using real experiences of children. - Democracy: children learn to take responsibility for their own work and for the whole community by using democratic self government. (excerpts from Wikipedia) [...] challenging is Freire's strong aversion to the teacher-student dichotomy. This dichotomy is admitted in Rousseau and constrained in Dewey, but Freire comes close to insisting that it should be completely abolished. This is hard to imagine in absolute terms, since there must be some enactment of the teacher-student relationship in the parent-child relationship, but what Freire suggests is that a deep reciprocity be inserted into our notions of teacher and student. Freire wants us to think in terms of teacher-student and student-teacher; that is, a teacher who learns and a learner who teaches, as the basic roles of classroom participation. [...]. On the shoulders of these giants, a couple of dwarfs created something we hope is useful for education and schools: Website@School. A school CMS must be a place where students can learn. Learn to create and publish texts, learn management tasks and administrative skills, experience markup languages, run and ruin their own style sheets and learn basics of coding. On every level, from writing their first text to writing code, a school CMS must be a learning tool for students. The website of a school needs special qualities. It differs from the home site of the Jones family and also it's certainly not the site of an enterprise or a business. A school is not a company. These notions require features that differ from most other (fine) CMS's. A school website is the place on the Internet where students, teachers, faculty, parents, the School Board, several committees and other parties can find a place to express themselves and communicate with all kinds of visitors. A school CMS must enable all these stakeholders to use the CMS for their purposes. A school CMS must take care of all their cultural differences and similarities in the way they express themselves and communicate with their sometimes special audiences. Most schools are not that rich. Websites of schools must be managed and maintained by many persons. All of them have little or no experience as webmaster, HTML expert or systems administrator. Often a school is mainly managed by hard working female teachers who like to teach, and not to manage some CMS. These circumstances call for a very secure, robust and stable but KISS (Keep it Simple & Straightforward) CMS for all those users. And last but not least, also an exiting environment for wizkid students, eager to investigate a CMS. A school CMS needs excellent documentation. A comprehensive user manual with a flat learning curve. Furthermore, extensive developer documentation targeted at a technical audience. And last but not least, well documented, well written code. Visually impaired and blind persons not only have the right on accessible websites, they also have rights on accessible CMS management. These viewpoints were shaped in the main features. Please read 2. Features. International cooperation. When schools use Website@School each user can work with the CMS her preferred language. Experiment in a safe environment where it is possible to make mistakes -the basis of learning- without harming the school CMS. All incoming materials are checked for viruses (see requirements). Do research with ICT tools. Learn HTML markup language in the plain HTML editor. Learn CSS with Bazaar Style Style (BSS) that students can manage themselves. Gain hands on CMS management experience in a safe environment. Learn to work in project teams. Learn to collaborate. Visually impaired and blind students can manage Website@School with braille terminal and/or screen reader. Website@School is not particularly difficult to use but it does require a willingness to read and follow the instructions. If you have a natural aversion to reading instructions, and your approach to new software is to click on every button you see until something resembles the desired effect, then Website@School is probably not suitable for you (Courtesy OmegaT User Requirements). Many people from all over the world are making Website@School available for students, teachers, parents and schools. Please contact us if you feel your name should be mentioned here. - Dirk Schouten (former teacher, manual writer, visually impaired, typos). Said Taki (Arabic), Boyan Kirchev (Bulgarian), Jing Fang Liu, Danny Yen (Chinese), Christian Borum Loebner-Olesen (Danish), Laura Råman (Finnish), Jean Peyratout, Marjolaine Audoux (French), Piet Damsma (Friesian), Claudia Göhnert, S. Stadoll, F. Kudzielka (German), Iakovos Christoforidis (Greek), Erika Swiderski, Gergely Sipos (Hungarian), Fabio Zaffora (Italian), Giovanni Thomas (Papiamento) A. Darvishi (Persian), Waldemar Pankiw (Polish), Rita Valente Ribeiro da Silva, Keli Tracz, Thais Rizzi (Portuguese), Anastassia Blechko (Russian), Anouk Coumans, Margot Molier, Hannah Tulleken (Spanish), Hansje Cozijnsen (Swedish), Ülku Gaga (Turkish), Nasira Parveen (Urdu), Quynh Nguyen (Vietnamese). Boyan Kirchev, Denitza Lambreva (Bulgarian) Rieks van Rooijen, Karin Abma (Dutch), Jean Peyratout, Marjolaine Audoux (French), Keli Tracz (Portugese), Anouk Coumans (Spanish), Hansje Cozijnsen (Swedish), Nasira Parveen (Urdu). Rod Fernandes (native English speaker who corrects our DutchEnglish) manuals. Yes! You can translate Website@School and help students, teachers and parents in your country. It is easy to do with our specially designed Translate Tool. If you have basic computer skills and know your mother-tongue and another language, please use our contact form on http://websiteatschool.eu. - Frederico Caldeira Knabben and his FCK- and CK editor. Frederico's site can be found at http://ckeditor.com/. - Ger Versluis for his HV Menu which is used in the Rosalina theme. We tried to get in touch with Ger to ask his kind permission to use his code, but we received no reaction. @Ger: please contact us. - Micky Faas, the Hague, the Netherlands ( Website@School logos), Pupils of grade 7 of the Barbaraschool Amsterdam, the Netherlands (group pictures), Hans Vissers, VU University, Amsterdam, the Netherlands Botanical garden (cacao tree picture), Greg Whitaker, Florida, USA (some icons), Lamco School Buchanan in LIberia (group picutre) @Lamco: please contact us. - Europees Platform voor het Onderwijs (European Platform for Education). - Stichting KBA Nieuw West (Foundation Catholic Primary Education, Amsterdam). - Openbare Basisschool Rosa Boekdrukker (Public Primary School Rosa Boekdrukker, Amsterdam). - Nederlandse Vereniging voor Blinden en Slechtzienden (Dutch Association for Blind and Visually Impaired). - Stichting Blinden-Penning, Foundation for activities for blind and visually impaired. - Stichting Mijn CO2Spoor (MyCO2Track Foundation). - Volkshogeschool Eerbeek (Folk High School Eerbeek). - Openbare Montessori Basis School ZieZo. - John F. Kennedyschool, Breda. - Catholic Primary School 'De Hoeksteen', Bussum, The Netherlands. J.G.M. Meijer, Hans Wolters, Stefan Schurtz, Rieks van Rooijen. Carla Alma, Margret Kwantes, Paul Wiebes. Detailed information on the features can be found in the chapters that describe the various managers, the available themes and -modules. Below a general description of the Website@School features in no specific order. Open Standards, Open Source Software under a General Public License. Freely available for everyone. Website@SChool complies with the 'Directive on Privacy and Electronic Communications', also known as the 'e-Privacy Directive' or the 'Cookie Law'. No cookies at all are placed on computer of the visitor of a site or on other devices. Focus on security, robustness and stability. Please don't believe us, check it! Separation of program- and data locations in the file system. Separation of markup- and programming language. Virus scanning on all incoming materials (provided the server has a virus scanner). Clamscan is automatically detected. Lists of permitted file-, image file- and flash file extensions. Extensive logging and status reporting with cut & paste for error reporting via e-mail. Well written, well documented, readable code. Manageable with braille terminal and/or screen reader. In sites management per user available skins for visual impairments. Illustrated (over 500 screenshots) comprehensive documentation targeted at the school users ensures a flat learning curve. The User's Guide is a context sensitive help function in the program. Mouseover texts. Short information texts or pointers to keyboard shortcuts are almost everywhere. Excellent developer documentation created with phpDocumentor [*] from well documented, well formatted code. Unlimited number of websites [**]. If needed every group or individual can have its own website. An Area or Section can hold an unlimited number of identical modules, for example blogs, redirections, etc. Several standard themes. Well documented, easy adaptable with Bazaar Style Style. Easy creation of your own theme which makes every lay-out possible. Sites can be split into new sites, or merged. Sections and pages can be moved around to other sites and sections. These features enable quick changes to any new site structure or lay-out. Unlimited (!) number of password protected Intranets. Unlimited depth in sections, sub-sections, sub-sub-sections, et cetera. Sections and pages can be images, thus permitting navigation and use for illiterate or young children. Easy installation (also for blind users) with a well documented GUI (Graphical User Interface) and additional Users' Guide documentation. No need to install anything on a computer. Webiste@School is installed on a web server. Translate Tool: Easy translation of the program to a new languages or adaption of text strings by technically unexperienced translators. Demonstration data. Website@School can be installed with demo data (demo sites, users and groups) in every available language. Useful for experiments and learning to manage Website@School. Easily removable. Easy upgrading and maintenance with the Update Manager. Proxy friendly URLs (configurable), to save bandwidth. Interesting for schools having no fast connection to the Internet. Full UTF-8, i.e. no problems with diacritical marks as well as non-western characters. Breadcrumb trails with some intelligence (reduces mouse clicks). Fine grained Role Based Access Control (RBAC). Each site, section or page can have its own admin(s) with permissions from 'none' to 'everything'. BSS (Bazaar Style Style, our educational implementation of CSS) permitting unlimited differences in styles by user editable style sheets in sites, sections and pages. Pages have meta-data and can be visible, hidden, read-only, under embargo- and expiry dates and can directly link to URL's. Alerts on 'everything' for 'everyone'. Groups of users with different group permissions (Unix style). This enables collaboration and project based work. And much, much more, please see the chapters in the Table of Contents. Each chapter has it's own features. [**] Yes, we know and agree with Jacob Kaplan-Moss in chapter Viewpoints, paragraph Links we like the article Teach, Don't Tell, but... see for yourself. [*] Websites on a Website@SChool CMS are called 'Areas'. We are now (2016) developing the educational in 'modules'. Modules are separate building blocks that perform special tasks. Themes define the lay-out of a website. Themes resemble stencils or templates. Skins define the lay-out of the management part of Website@SChool. They are developed for webmasters with visual impairments. Aggregator: aggregate pages and snapshots. The aggregator collects pages and images an puts them on one page. Althing (weblog): A weblog with educational features like harvesing and reports. Confab (chat): A chat with educational features like reports and braille interface. Plain HTML editor: No frills HTML editor. Mailpage: send mail to departments or individuals. No unreadable CAPTCHA's, developed for blind users. Redirect: to create a page that redirects to another site. Sitemaps: for all sites, one site or links to other sites. Snapshots: picture albums with thumbnails, manua- Mededelingenl viewing of images, full screen slideshow for shows on TV sets. Workshop (CREW): Collaborative Remote Educational Workshop. Remote real-time editing. Editors:WYSIWYG (What you see is what you get ) editors: CKEditor and FCKEditor in different versions. Skins For an overview of available skins, please see the , paragraph 5. Skins. Please help us by developing more modules, themes and skins. For an overview of necessary modules, please see latest updates on modules. Turkish (tr): unfinished, translator needed. Check our http://websiteatschool.eu site to see if new languages are available that are not yet incorporated in Website@School. You can help schools in your country by translating Website@School. The system provides an easy Tanslate Tool for 'on the fly' translating the program. Any teacher can do it. Please help other schools by translating Website@School in your language. We have a special Translate Tool that enables online translations. Creating a new language version is a piece of cake. Help us with feature requests. Help schools with developing and coding for Website@School. E-mail us the URL of your site. You can use the E-mail link at the bottom of the Home Welcome page in Website@School Start Center. JoinUp: Our download location at https://joinup.ec.europa.eu/software/websiteatschool/release/all. Here you find all Website@School program downloads, manual- and developer-documentation downloads. JoinUp is processing our publication request. In the mean time the latest version of the Website@School software and documentation can be downloaded via http://websiteatschool.eu/index.php/area/14/Downloads.html. Joinup project page & downloads: Clumsy site: https://joinup.ec.europa.eu/software/websiteatschool/home. Decide if you want a .tgz or .zip. The downloads are alphabetical, so the first is the .tgz and the second the .zip. On the next page you are importuned with a Joinup 'feature'. At the bottom of the page is 'No, i prefer to remain anonymous - start the download. Newsletter: New versions will be announced via our own newsletter Website@School News at http://websiteatschool.eu/index.php/124/WebsiteAtSchool_News.html. You are aware that all postings of open source encryption code controlled under U.S. Export Control Classification Number (ECCN) 5D002 must be simultaneously reported by email to the U.S. government. You are responsible for submitting this email report to the U.S. government in accordance with procedures described in: http://www.bis.doc.gov/encryption/PubAvailEncSourceCodeNofify.html and Section 740.13(e) of the Export Administration Regulations ("EAR") 15 C.F.R. Parts 730-772. Website@School may or may not contain cryptographic code depending on the definition of 'crypographic'. We do not have the time nor the inclination to invest our valuable time in researching whether we do or do not (or worse: maybe do) need to comply with rules and regulations that may or may not be compatible with those that are not completely foreign to us. BerliOS download site: To our regret we had to abandon this download location because BerliOS now also uses the Sourceforge infrastructure. Website@School can now be downloaded from Joinup. Further reading, if you like. A lot can be found on the Internet. Eric Steven Raymond: The Art of Unix Programming. The first chapters are quite readable and very interesting for a layperson. It can be found on http://www.faqs.org/docs/artu/. On Célestin Freinet and Paolo Freire. Tons of materials can be found on the Internet. Wikipedia is your friend. Site@School is no longer supported: due to its rapid expansion it became unmanageable, unmaintainable, insecure and by grown knowledge, it used low standards in code quality. However, there was little need to change it's basic requirements. In that way Site@School was an excellent prototype. We only had to add long needed educational features that were impossible to incorporate in old Site@School. 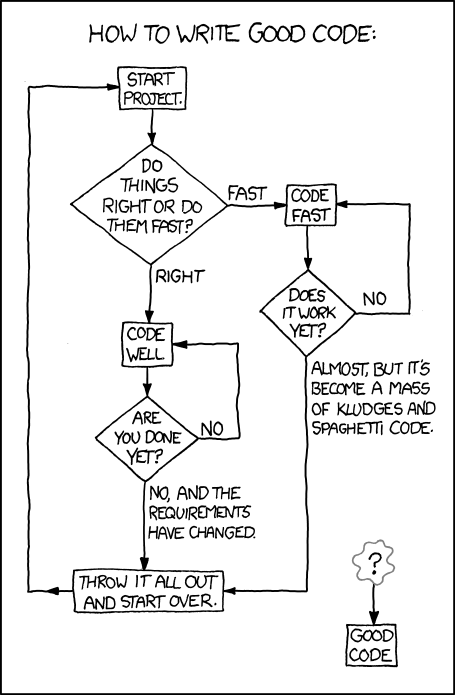 : Courtesy Mr. Randall Munroe of xkcd.com who permits using his comics for this use. Source: http://m.xkcd.com/844/. Nuff said, back to work.